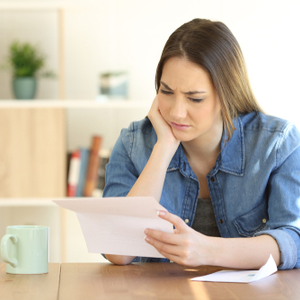 Receiving an unexpected letter from the IRS in the mail typically comes with an initial feeling of worry, concern, and confusion; especially if it relates to a topic you are not familiar with, such as backup withholding. We understand that mistakes happen and realize how stressful it can be when filing 1099s during tax season. We’ve been getting these questions a lot lately, so we thought it would be a great idea to make the answers readily available as the season for 1099s approaches. Here is what to do after the IRS sends you a 1099 correction notice. First, let’s explain the notice you received, CP2100 or CP2100A, and the first steps you’re responsible for after the IRS sends you one. What is a CP2100 or CP2100A Notice? It is a notice that tells a payer that he or she may be responsible for backup withholding. It is accompanied by a listing of missing, incorrect, and/or not currently issued payee TINs. Large-volume filers (250 or more error documents) will receive a CD or DVD data file CP2100, mid-size filers (between 50 and 249) receive a paper CP2100, and small filers (less than 50) receive a paper CP2100A. What should I do if I receive a CP2100 or CP2100A Notice? First, compare the listing(s) with your records. If you are missing TINs and have not started backup withholding, you should begin to do so immediately and continue until you receive a TIN. You must make up to three solicitations for the TIN (initial, first annual, second annual), as described in Question 19, to avoid a penalty for failing to include a TIN on the information return. For incorrect TINs, compare the accounts on the listing with your business records. Next, if the payee agrees, send them the appropriate “B” Notice. If an account does not agree, this could be the result of a recent update to SSA records, an error in the information you submitted, or an IRS processing error. If this type of error occurred, the only thing you should do is correct or update your records, if necessary. Note: You do not have to call or write to the IRS to say that you made the correction or update to your records. What is a “B” Notice? A “B” Notice is a backup withholding notice. There are two “B” Notices –– the First “B” Notice and the Second “B” Notice. You must send the First “B” Notice and a Form W-9 to a payee after you receive the first CP2100 or CP2100A Notice with respect to this account for soliciting a correct Name/TIN combination. You must send the second “B” Notice to a payee after you receive a second CP2100 or CP2100A Notice within a 3 calendar year period. The text of the Second “B” Notice is different from that of the First “B” Notice. The Second “B” Notice tells the payee to contact the IRS or SSA to obtain the correct Name/TIN combination. The mailing of the second notice should not include a Form W-9. The payer must receive validation of the payee’s Name/TIN combination from the SSA or IRS after sending the second “B” Notice. Payees should be instructed regarding how to request validation of their name/TIN combinations in accordance with the procedures described in Part 4. Generally, you do not have to send a “B” Notice more than two times within three calendar years to the same account. When do I send a “B” Notice to a payee? You are allowed 15 business days from the date of the CP2100A or CP2100 Notice, or the date you received it (whichever is later), to send a “B” Notice to a payee. For incorrect TINS, you only have to send the “B” Notice to a payee whose Name/TIN combination and account number on your records agrees with the combination that the IRS identified as incorrect. Do I have to mail a second “B” Notice if I receive the second CP2100 or CP2100A Notice in the same calendar year as the first notice? No. You may disregard the second CP2100 or CP2100A notice, even if it relates to a different tax year than the first notice. You are also obligated to mail a second ‘B’ Notice if you receive the second CP2100 or CP2100A Notice in a different calendar year than the first, but both of the CP notices relate to the same payee’s account for the same calendar year. So What is Backup Withholding? Persons (payers) making certain payments to payees must withhold and pay to the IRS a specified percentage of those payments under certain conditions. So basically, if a company regularly hires a 1099 worker, and the company receives notice that the TIN is incorrect/missing, they can (under the conditions listed) start backup withholding. If they do not regularly hire the contractor and do not hire them again, the payer is NOT responsible to pay the backup withholding, but they should notify the IRS that they have performed their duties to get the correct TIN. What Qualifies as Backup Withholding? Payments that may be subject to backup withholding include interest, dividends, rents, royalties, commissions, non-employee compensation, and other payments including broker proceeds and barter exchange transactions, reportable gross proceeds paid to attorneys, and certain payments made by fishing boat operators. What payments are subject to backup withholding? Rents and commissions, non-employee compensation for services, royalties, reportable gross proceeds paid to attorneys and other fixed or determinable gains, profits, or income payments reportable on Form 1099-MISC, Miscellaneous Income. Interest reportable on Form 1099-INT, Interest Income. Dividends reportable on Form 1099-DIV, Dividends and Distributions. Patronage dividends paid in money or qualified check reportable on Form 1099-PATR, Taxable Distributions Received From Cooperatives. Original issue discount reportable on Form 1099-OID, Original Issue Discount, if the payment is in cash. Gross proceeds reportable on Form 1099-B, Proceeds From Broker and Barter Exchange Transactions. Gambling winnings reportable on Form W-2G, Certain Gambling Winnings, unless subject to regular gambling withholding. If not subject to regular gambling withholding, backup withholding only applies if, and only if, the payee does not furnish a taxpayer identification number to the payer. Gross payments reportable on Form 1099-K, Payment Card and Third Party Network Transactions. Form 1099-G payments that are subject to backup withholding under IRC 6041 and 3406(b)(3)(A) which include taxable grants and agricultural payments (1099-G Box 6 or 7). When is a TIN considered missing or incorrect? A TIN is considered to be missing if it is not provided, has more or less than nine numbers, or it has an alpha character as one of the nine positions. What should I do if a payee refuses or neglects to provide a TIN? Begin backup withholding immediately on any reportable payments and complete the required annual solicitation (request) for the TIN. Note: Question 19 has information about the solicitation requirements for missing and incorrect TINs. Backup withhold until you receive a TIN. How do I know if a TIN on my account is incorrect? After Form 1099 information returns are submitted, the IRS will send you a CP2100 or a CP2100A Notice and a listing of incorrect Name/TIN(s) reported on those forms. Mistakes are only human. TaxBandits wants to ensure that tax filers can avoid hefty penalties from the IRS, even when they mess up. Create a free account today, and e-file 1099s that come with our built-in audit error check. Our step-by-step instructions are easy to follow and save you time throughout the filing process. If you need assistance while filing, just give our US-based support team a call Monday – Friday from 9 AM to 6 PM EST at 704.684.4751. You can also reach us via live chat and take advantage of our 24/7 email support at support@TaxBandits.com.